TIMBA stands for TiTim’s Mountain Biking Association. We pay him dues each year in the form of beers and he let’s us use his playgound. Since we only ride there once or twice a season, I think we get the shaft as far as the dues, but it keeps TiTim happy and frankly a happy TiTim means “entertainment value (EV)” is right around the corner. I just wonder when that entertainment value will materialize this year as he’s been solid in practically every ride. No major crashes or blood. Actually it seems I am providing the EV most of this season. Hmph. That will have to change. I wrote that paragraph above yesterday before the ride. As a result, I think I jinxed TiTim. He was flailing all around last night. He had 2 major “downs” and a few minor ones. Hee Hee. Not a lot of blood action in these falls which is a watched metric as to the level of EV, but they were fun to witness. Good show TiTim!! Gringo was MIA last night. Either he went too hard Wednesday night with the MoFo’s or he really was remodeling his kitchen, as he said. I’m not sure which to believe. Geo almost went a whole evening with his bike intact, but alas a record was not to behold. He had Goodales do some work on his bike and we all know what kind of results take place after they touch one of our bikes. Kaaapow! Almost through the ride, he found his rear shock to be wanting something…like some stiffness. The thing was going up and down faster than a virgin male on his first time. We figure Goodales must have broken a seal or did something to it and it worked right up until the end of the ride. Dammit. Nobody take your bike to Goodales anymore!!!! The TIMBA Playground was pristine as usual. It is a nice long ride with a few challenging moments spread throughout. We tried out a new “bridge” that TiTim had built. I swear there was a major gap at the beginning of it, but it seems that no one else noticed it. TiTim says he created the new trail but I think he was just making it up as he went along. He needs to get the MoFo’s out there to show him how trail building is done. No Offense TT. There was one trail that was recently named Rudy Giuliani down by a brook due to the number and size of the roots you have to go over. Get it? Rooty, Rudy. Never mind. You had to be there. 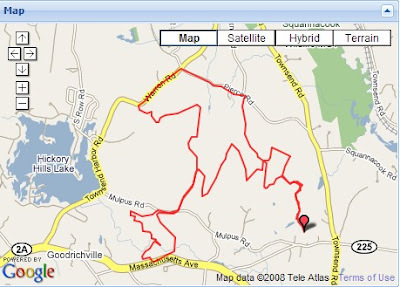 So anyway, here is the course detail as uploaded to Garmin Connect. We went 11.28 miles in 2:14:08 ride time averaging 5 mph for the ride. At one point I hit a max speed of 23.7 mph. For this mountain bike ride and all future ones, we determined that the Auto-Pause feature should be turned off, so the average ride speed will always be lower from now on. We did this because it was affecting the map quality because we slow down and stop so frequently on the mountain bikes. The detailed map didn’t come out so nice because Google Earth seems to be missing the detailed data on the area of the loop, but here is the KMZ file anyway to open in Google Earth to see what I mean or maybe it will be clear for you. I also included a topo map version and the topo KMZ overlay. Open the topo KMZ file in GE and then open the regular KMZ file and they appear together. It was a nice ride last night and the weather was perfect. It cooled off nicely as the ride progressed. We must get the most out of our dues and ride it again when we are Four once more. TiTim hosted the post-ride activity…hot dogs and Wachusett Summer Ale. Mmmmmm. Looks like rain on Sunday so the road bike will have to wait another week.